From Canmore follow the directions in town towards the 'Nordic Center'. Continue on around the reservoir and dam until you reach the 'Goat Creek' trailhead parking lot. This is the same parking lot you would use for 'East End of Rundle'. Once parked, walk across the main road and up the gated service road. You will cross over a bridge and pass a small utility building on the right. Follow the well defined trail from there up the mountain. We left the house in Canmore at 3:45am, Colt 45 in hand. We concealed it in a paper bag to keep things classy. We arrived at the goat creek parking lot just before 4:00am and began getting ready for the hike. We were the only car in the lot with the exception of a snow covered van that was probably left overnight. With the trail for Ha Ling Peak being pretty well defined, it was not difficult to follow, despite the 4 or 5 inches of snow that had fallen the night before. With the help of head lamps, we were making good time and were at tree line within 1.5 hours. 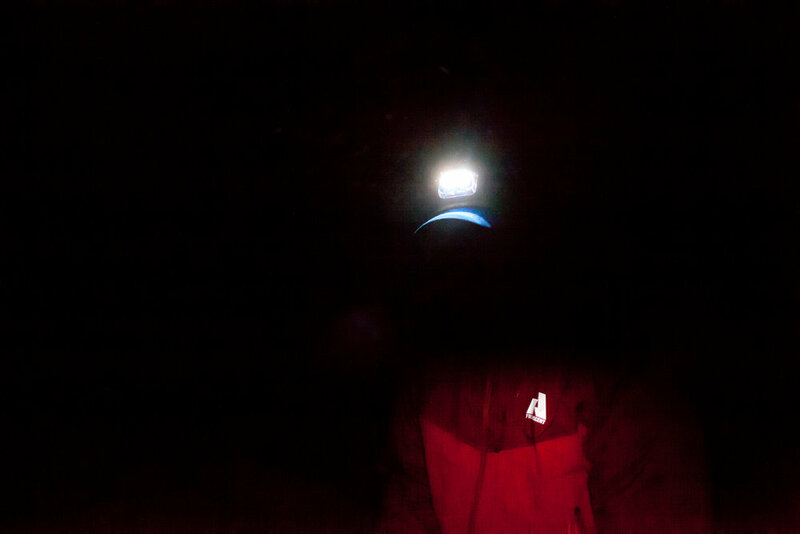 I snapped a few photos of Jimmy, as he was lit up by my headlamp because my headlamp was pointed downwards; it created a strange invisible man effect. As soon as the trees ended, so did any sign of the trail. The recent snowfall combined with the darkness made it next to impossible to continue following what we thought was the trail. This made the next 150m of the hike very difficult, as we were having to trudge through deep snow without the help of snowshoes. After about 15 or 20 minutes of tiring climbing, we managed to reach an area of rocky shale that had far less snow on it. We then hiked another 100m to the ridge that divides Ha Ling Peak and Miner’s Col, arriving by 6:30am and stopped to have some food and take some photos. With the approaching storm the valley was covered in a low layer of fog and we could see the glow of the city lights below us. Just 5 minutes later the city and its lights were completely covered in a dense layer of fog. With what seems like the now common place extreme wind that accompanies Ha Ling Peak we decided to quickly head for the summit. After reaching the top, we found a small area of rocks that were sheltered from the wind where we stopped to have the rest of our food. As we squeezed into this tiny space that could barely fit the two of us. With the sun now up and the deep snow, we quickly jogged/slid down towards the tree line. Once we reached the trees, we chose to just slide straight down rather than use the trail. The deep snow made it easy for us to slide our way to the bottom in just 30 or 40 minutes. I will try and post some videos of this later this week. We crossed over the small bridge at the bottom just before 9:00am. Five hours of hiking with relatively no bad falls and Jimmy bails hard in the last 50m on the access road down to the parking lot. The fresh layer of snow was hiding a completely iced over road beneath. After reaching the car and heading back to town, we stopped in at the Bagel Co. for breakfast. We both had the 'Mountaineer', which was basically a Montreal smoked meat bagel sandwich. AMAZING.